Emma Rose grew up between the West Country and London, loving equally the countryside, the sea and the city. Her colourful family instilled a love of art, theatre, literature, photography, dance, nature, gardening and a wander-lust. After being educated at Sherborne in Dorset, she settled in London. A vibrant London career followed - in theatre (Maybox Theatres) and film (Hobo Films, Mayfair Entertainment, Zooom Photographic and Film & General Productions) alongside dancing/choreography (Flos and Theatre In Trust). 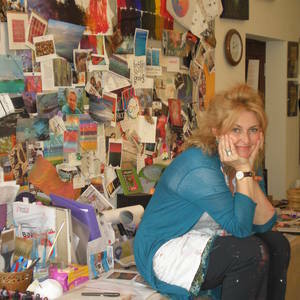 During these years she also studied painting, photography and sculpture in Chelsea through ILEA. In tandem there has also been a life time of artistic tuition with her step-father, Godfrey Cake FRSA the painter, photographer and sculptor. She also trained in tap, modern, jazz and choreography at the Dance Centre, Covent Garden. After moving to Somerset she settled in a beautiful village just outside Bath in a designated Area of Outstanding Natural Beauty. In Bath she studied abstract theory/colour/technique which fueled her creative passion to open her Art Studio in Wellow. From an early age, Emma travelled extensively - these vivid experiences often revealed in her work, from memory and imagination. This combined with her keen interest in the processes of growth in nature and landscape evolution - helps her paint from her 'internal reservoir of remembered senses'. With an obsession for colour, form, texture and patina, her eye finds beauty in the most unlikely places which makes her work atmospheric and evocative. In tandem, the natural world and a love of books has led her to a distilling of her exuberant style into literary land and seascapes. Her atmospheric canvases pulsate with exotic colours , textures and dynamic brushwork and mark making. The skies and landforms reflect her interest in the Japanese aesthetic of Wabi-Sabi...the process and beauty of ageing which creates irregularity and imperfection. Her work seems to delight people for its beauty - she does not follow the trend for edgy or dark work - just pieces that glow with light within. Small and large scale work, and commissions are eminently covetable, and for the time being at least, affordable for the discerning middle-income collector. She now regularly exhibits in London, Bath, the West Country.